It is a beautiful morning and I’m sitting on the deck and enjoying hearing the birds chirp and call each other, the wind rustle the leaves, and watching Ivy inspect the yard to keep us safe from critters of all sorts. It has been a delightful time though I’ve frittered away some prime writing time by thinking, reading, and looking back. 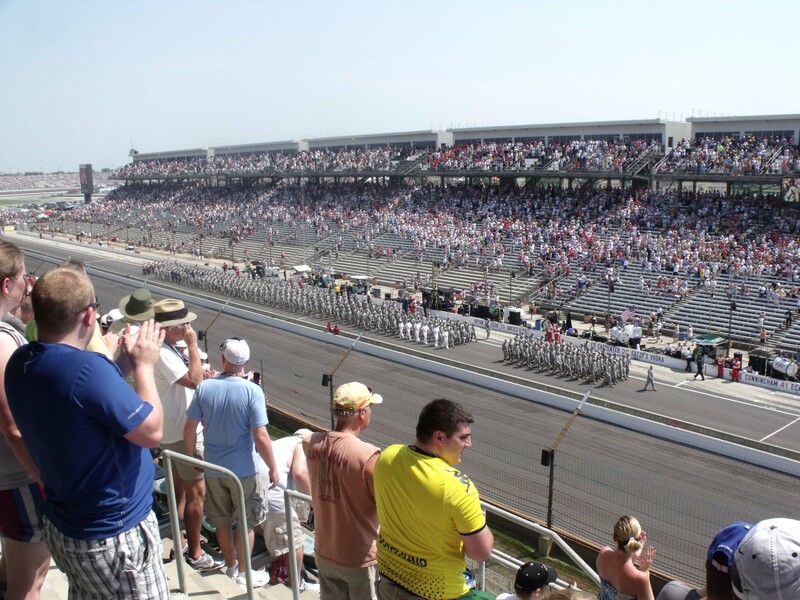 Yesterday, William and I went to the Indy 500. It is a family tradition – started by Beth through Beth’s dad, and continued through her brother, Tim. I’ve been going since 1991, and William, since 2004. It was a great race but an even greater day – father and son together enjoying time together and a tradition they share. It was a good time. But, I want to write about today and what it means. A few years ago, I travelled to Washington, D.C. for the annual NEA Convention. I had hoped Beth and the kids would come along, but it didn’t work out and I went alone. While I was there, I took time to explore and the World War II Memorial and the Vietnam Memorial were among the many places I visited during that trip. I remember my visit, in particular one afternoon and evening, it was early July and a beautiful evening. I remember walking down the mall and taking my time walking, taking it all in – the Mall, the Washington Monument and the two memorials. 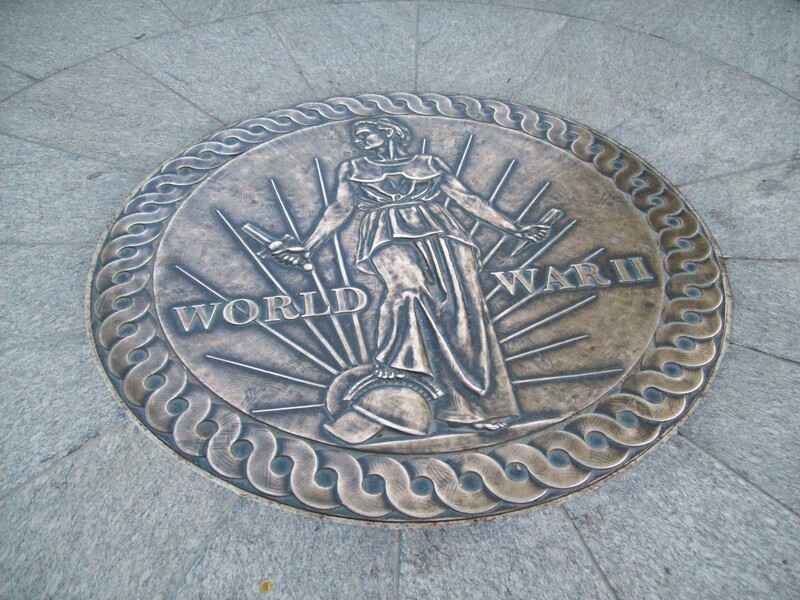 At the World War II Memorial, there were kids playing near the fountain and lots of activity. I saw several veterans with their families and I stopped to ask an elderly veteran about his service. He proudly told me where he served, what he did, and what he did after the war. I listened intently and thanked him for his service. As I walked down the Mall toward the Vietnam Memorial, I thought about what he said and what he did. It made me think about my father-in-law and the sacrifices made by millions of men and women who gave all they could so that I could be free. I am not certain that it was love of man, but love of country that motivated those who served to serve in the military. Perhaps, it was that they did what was expected of them, because it was expected, because it was their duty. I have asked many veterans what they did and where they served. I always thank them and I feel guilty for not having served my country. My generation benefitted from the veterans of World War II in that we had a safer world in which to grow up and a call for us to serve as they did was never made nor needed. Nevertheless, I still feel guilty. My father served as a marine, my father-in-law in the navy, and Beth’s cousin, Douglas E. Dickey in the marines died in Vietnam. I found his name on the wall that afternoon, surrounded by the names of others who died that day so far away defending my right, my future right, to write, read, and say what I think. 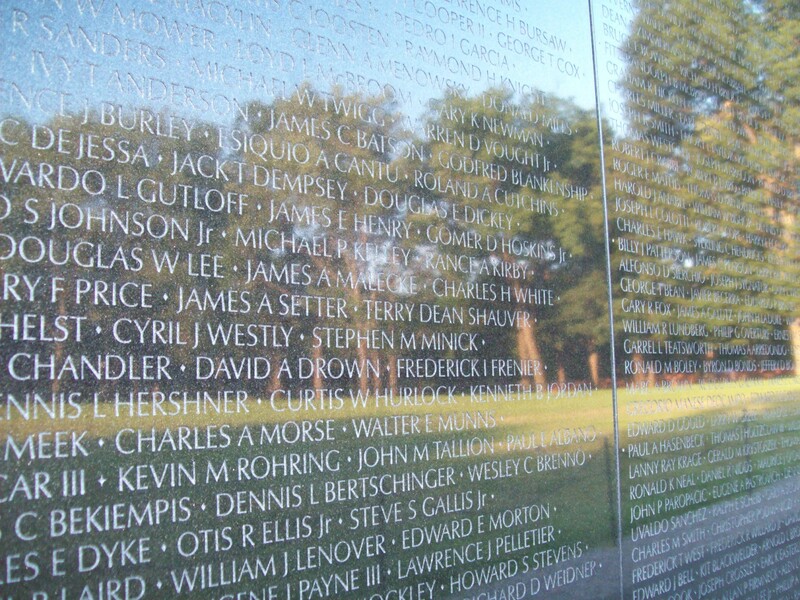 “The Wall” – The Vietnam Memorial in Washington, D. C.
Our debt to the heroic men and valiant women of our country can never be repaid. They have earned our undying gratitude. 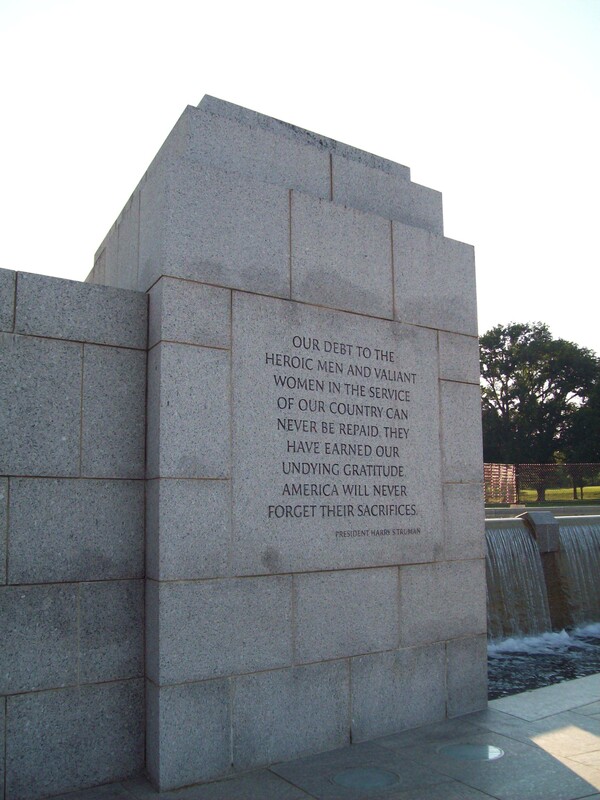 America will never forget their sacrifices. President Harry Truman, from the World War II Memorial in Washington, D. C.
The World War II Memorial in Washington, D.C. I, too, owe a debt of gratitude to those came before me and I can repay it by reminding myself, my kids, and my students that Memorial Day is a day to remember, reflect, and rededicate our lives to make our country a place where freedom and the importance of service to man continues to live. Memorial Day is about remembering and Making the days Count. What will you do to make your Memorial Day Count?